Special Olympics Nebraska is once again excited to partner with our friends at Mount Michael Benedictine School﻿ for our annual Flag Football Invitational! Special Olympics Nebraska teams from across the state will compete in the tournament, hosted in conjunction with the Mt. Michael Fall Festival. 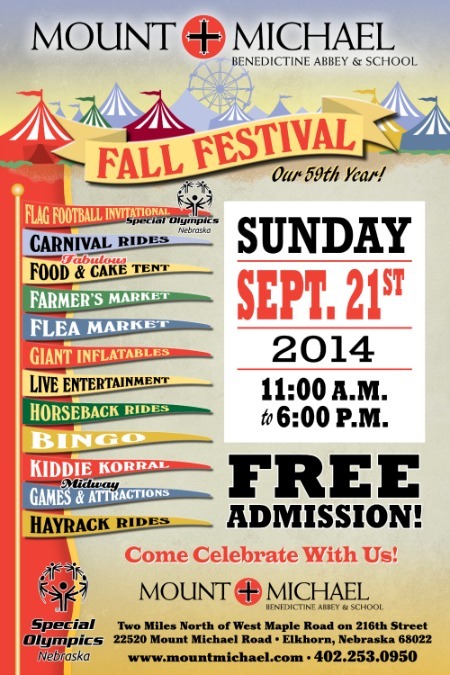 Come cheer on your favorite team and stick around for carnival fun, horseback rides, bounce houses and bake-offs! We are looking for volunteers to come out and help at the Fall Festival! Job descriptions are below. If you can volunteer, please reach out to Kelli Bello at kbello@sone.org! Specifics: 5-6 volunteers to help direct traffic and park cars. We have a professional that will train and give direction. Just need people that are able to be on their feet for a few hours. Specifics: We will have 4 golf carts on loan from EZ Go to shuttle handicapped Special Olympics families to and from the games. We need 4 responsible, adult drivers per shift – over 21 years of age to drive folks from the parking lot to the field as it’s a long way to walk. Hours: 2 shifts: 10:30am – 2:30pm and 2:30 – 6pm or earlier, until games are finished. Specifics: 4-5 people for each shift to help John Manna and referees with game time duties; i.e. hold flags, assist with games and anything else needed on the playing fields. Hours: 2 shifts. 11:30am – 2:30 and 2:30 - 6pm or earlier, until games are finished. Volunteers should park in Lot C. Wear a Special Olympics Nebraska t-shirt or a red shirt. Thank you! We are excited for a great event!